I’m about 60 pages in and feel like CFAI really complicates what we need to know. Anyone recommend ditching the CFAI readings, going with Schweser, and doing the EOCs from the CFAI books? 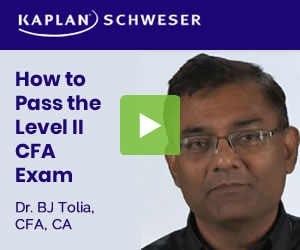 CFAI really complicates what we need to know. It makes perfect sense. Even Mark Meldrum says the CFAI text complicates the formulas. Do you plan to switch CFALOBO? Why would a third party provider state anything else? It is best to review Derivatives Topics either from Kaplan Schweser / Wiley or from Mark Meldrum Videos. The CFAI Curriculum for Deriviatives is not written in a manner which can help candidates to grasp and understand the concepts and which can prepare the candidates well for the exam. Anyone recommend ditching the CFAI readings, going with Schweser, and doing the EOCs from the CFAI books? I do all my reading from Schweser… then I do qbank and eoc… Then I might read a few sections straight from CFAI text if I need to take a really deep dive!